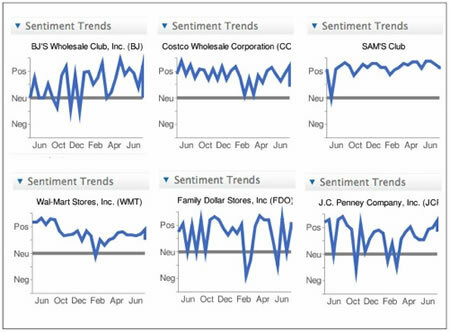 Sentiment analysis is a relatively new field that is heating up, thanks to the fascination that big companies have with how we feel about them. The basic idea is that we betray our feelings as we chat to each other in social media like Twitter and Facebook. Consultants like Newssift download the chatter and then analyze it, and present corporations with graphs like the one below. Is positive sentiment toward your hypercorp waxing or waning? Here are the hard numbers presented to big retailers. So how does sentiment analysis work? (I'm fascinated by the idea that an entirely new science of computer analysis is needed to find out how we consumers feel about companies that promise one thing and deliver another. Large corporations (or hypercorps, to use John Brunner's word for them from The Shockwave Rider) could easily find out specific facts about their services that consumers do not like. For example, AT&T can read a variety of factual criticisms about their iPhone service in a number of recent tech site blog posts. However, it is costly to track actual problems with services, and then fix them. Hypercorps like AT&T spend billions honing their brand images, which is just a phrase referring to how we feel about them. If they can track how we feel about them, and then fix how we feel, then the problem is solved. Anyway, the idea that computer systems might one day learn to interpret the vagaries of human feelings has a long history in science fiction. 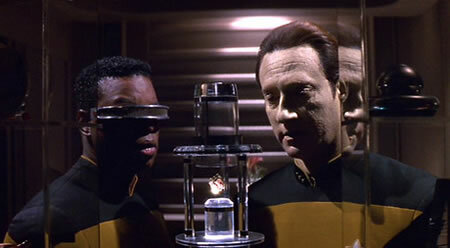 I'm sure that there are a lot of people who remember that Star Trek: The Next Generation's Commander Data made use of an emotion chip to actually feel emotions himself, which helped him understand his human coworkers and friends. If you'd like to read an informative article about sentiment analysis that is free from parenthetical ranting, visit NYTimes.com, and you might sift through the informative blog posts on Newssift.